Temples in Asia fascinate me. Unlike our North American churches with their air of solemnity, hushed tones, and calm divinity, Asian temples are often a whirlwind of swirling incense smoke, banging drums, and merchants hawking offerings to the gods for the faithful who didn’t come prepared. I feel uncomfortable entering churches. I don’t know why. I feel intrusive; like I don’t belong but might be mistaken for someone who does. I feel like an interloper; watching the faithful pray is like taking a peep through the curtains into someones private life. I feel noisy; as though every rustle of my coat is disturbing the peace that cloaks the pews. Yet I don’t feel this way in temples. Perhaps it’s because so much of Asian life is lived in public; witnessing someone at the temple is no different than witnessing them read their paper on the front stoop, have a meal at a roadside stand, or chat with their scooter-mate at the stop light. I so obviously don’t belong that I don’t have to worry about being mistaken for someone who does and, with all the commotion going on, it’s unlikely that I will disturb anyone. It is the incense that I love the most. The sweet, cloying, scent that drifts upward welcoming all those who enter. I love the great vats of it smouldering away and being added to constantly. 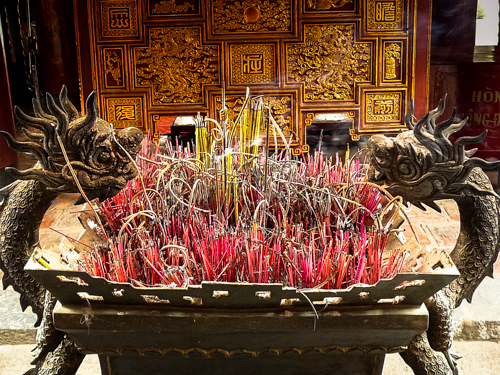 In fact, whenever I smell incense, no matter where I am, I am instantly taken back to a temple like this one in Hanoi. It has been unseasonably warm here in southern Ontario. This is obviously good for those of us who enjoy squeaking out the last flip flop days and sneaking one last beer on a sunny patio. It is not so good, however, for those of us who were hoping to revel in the beauty of the infamous fall colours of the area. Without a good early frost the trees are confused. Their internal clocks tell them it is time to let the leaves go but the weather tricks them into thinking it is still late summer. 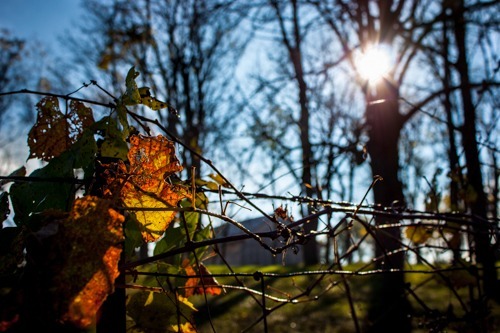 The leaves are falling but they lack the brilliant hues I was so looking forward to seeing. It doesn’t mean it’s not beautiful though. 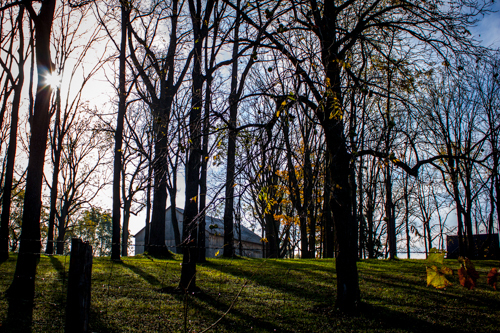 Yesterday we took a drive through the country side and came home inspired by beauty. The leaves have fallen but beauty remains. 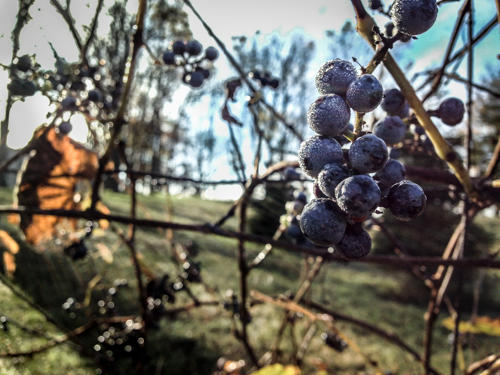 Wild grapes along the fence line. The leaves want to be brilliant. They float high on the walls during the day but descend into the street at night as shops and storefronts are shuttered. 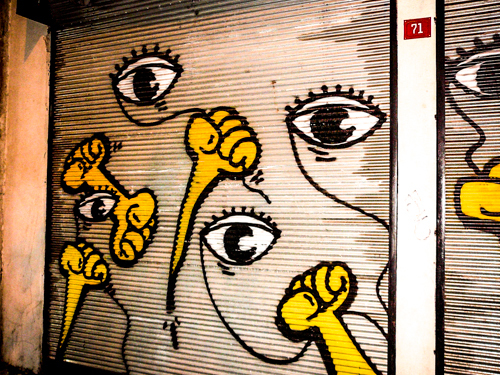 These yellow fists and bright eyes are all over the Beyoglu district of Istanbul. Created by the street artist Kripoe they lend an eerie element to the downtown core. I like that most of them are hidden during the day; it’s a transformation as night falls and they are revealed. This. This is what is missing here in Canada. 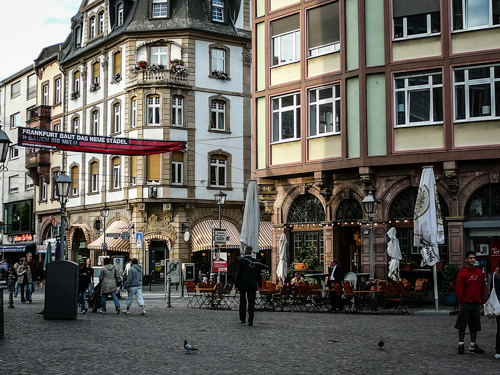 City squares with shops, and businesses, and cafes with outdoor seating. A place to gather and relax, meet up with friends, or enjoy a cocktail on the patio. We are a car culture through and through and forget about the value of open space, the aesthetic of great architecture, and the beauty of simple pleasures. One day. One day I will live in Europe and take advantage of all it has to offer! How hot can you take it? 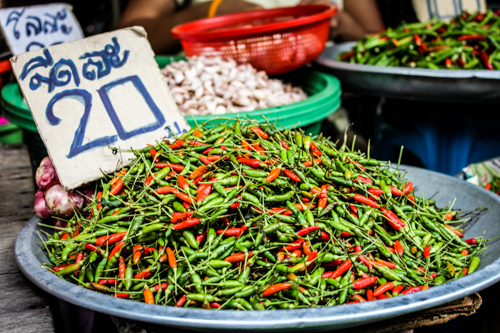 Markets and food stalls abound with hot red and green chilies. They are used in everything from salads to stir fries to curries. Most often the cook would ‘westernize’ the recipe for us and, where they might usually throw a handful (seriously!) in, they would only pick one or two. Believe me, that was enough! The Thais definitely like it hot though and wouldn’t even break a sweat eating such spicy food. This was one of those quintessential travel moments. 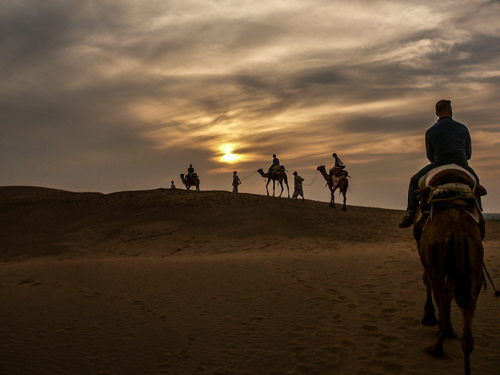 Riding camels over the desert dunes. Watching the sun set in a blaze of red and orange. The absolute stillness of the earth at that moment. We stopped into this family compound while on a bike tour outside of Ubud on the island of Bali. It was raining dreadfully hard so, instead of learning about the compound and how the family all works together, we all huddled under the eavesas best we could. This old man was sitting looking terribly amused. When I motioned to ask if I could take his picture he insisted on standing to pose. Much of Kathmandu is a haze of pollution, tangled wires, narrow alleyways, belching cars, aggressive touts, and overwhelming noises and smells. 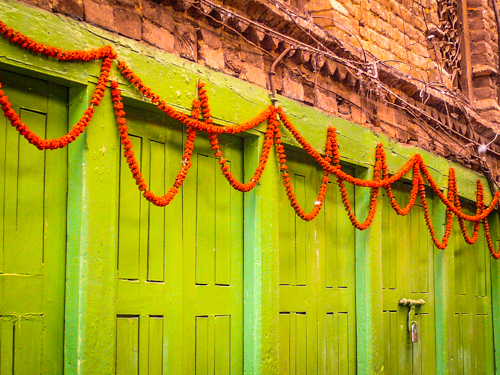 This closed up shop hung with a marigold ‘torana’ offered some visual peace; a sense of calm in a city full of calamity. While in northern India we hired a car and driver (that’s Laxman with his back to the camera) to take us from site to site, town to town. The first day of the drive he pulled into a tourist restaurant complex on the side of the highway for us to have some lunch. It was a bland, banal affair with jacked up prices and toned down food. We got back in the car after lunch and asked him not to stop at places like this again. We agreed that each day we would stop for breakfast and lunch at spots that he, personally, would usually stop at. This turned out to be a decision that showed us the ‘local’ way of life but also mostly had us wondering when, not if, we would be sick. 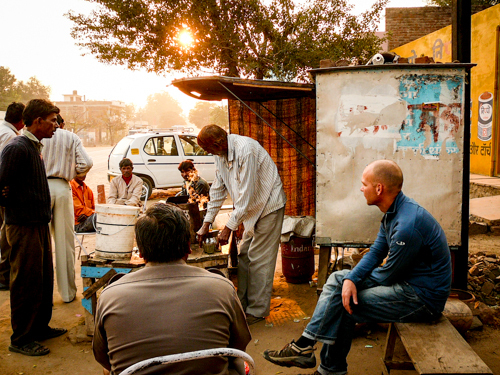 This was a typical afternoon stop at a chai-wallah, or Indian tea, stand. It was as dirty as you imagine it to be; my only solace being that the milk and tea were heated to beyond boiling. We may have burned our fingers endlessly trying to hold the tiny, hot, glass cups and our tongues on the scalding liquid but we never, ever, got Delhi Belly. 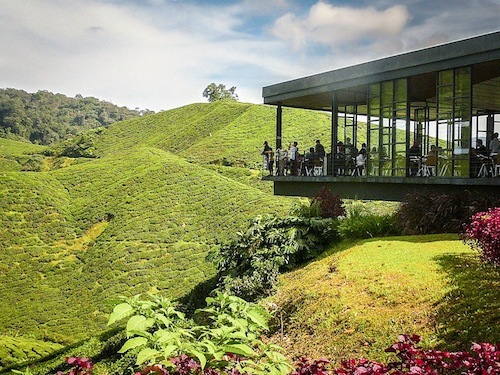 The Cameron Highlands of Malaysia are a cool oasis from the hot, humid lowlands below. I was surprised by the modern architecture of the BOH Tea House on the grounds of the plantation. I don’t know what I was expecting but it sure wasn’t this Frank Lloyd Wright reminiscent piece of work that jutted out over the tea fields below. Others might have expected something a little more rustic, but I think it added to the scenery perfectly. That’s more than 500 years ago! The sense of time and history in Turkey was often lost on me as I tried to imagine what the world, and life, must have been like when this hammam was constructed oh-so-long-ago. 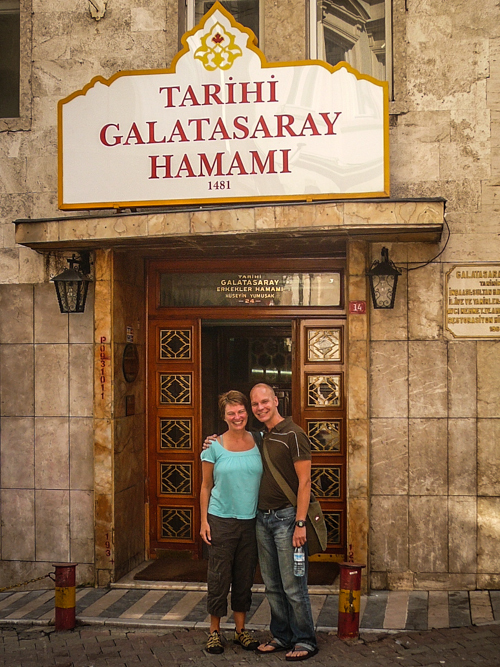 I wanted to experience a piece of that tradition and history while in Istanbul and so researched one of the oldest bath houses in the neighbourhood. It was one of the most…ummmm…interesting experiences of my travels and, without doubt, spawned one of my favourite travel stories. Read All Cleaned Up to hear more of the soapy tale.